Although confused with other religious tradition, the concept of trick-or-treating actually originates as a custom during the 1920’s that involved pranks ranging from simple annoyance to tragic violence. in hopes to end the mischief, the trick-or-treating we know today really grew in popularity by the end of 1940s. 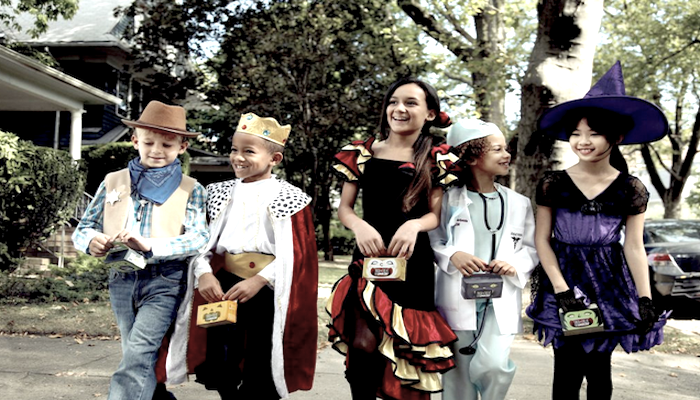 over the last 60 years, trick-or-treating continue to evolved and is a common custom around the world, as well as the million dollars industry focus mainly on costumes,candy and decoration. even though the violent prank decreased,some criminal behavior and accident are shown more on hollowed in certain areas. however there are some simple safety rules to follow when you take your children on trick or treating that will help ensure they have a wonderful time and return home safely to enjoy their stash of Halloween treats. when possible use sidewalks. this will reduce a chance of being hit by a car.if there are no sidewalks available, walk as close as possible to the curb and walk against traffic. 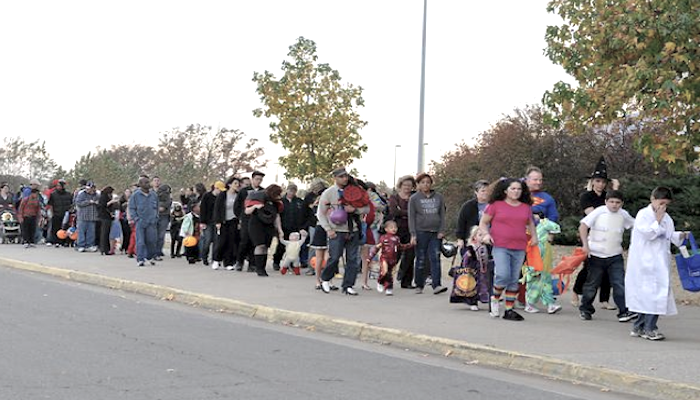 trick or treating in groups has a variety of safety benefits. the larger the group,the better. also walking in the groups makes the band of tricks or treats more visible to drivers. 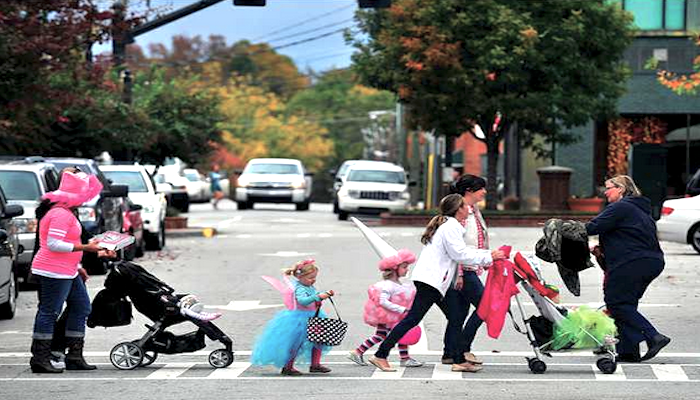 be sure remind your child the basic safety tips when it comes to crossing the street. make sure your child remember to look both ways before crossing the street. 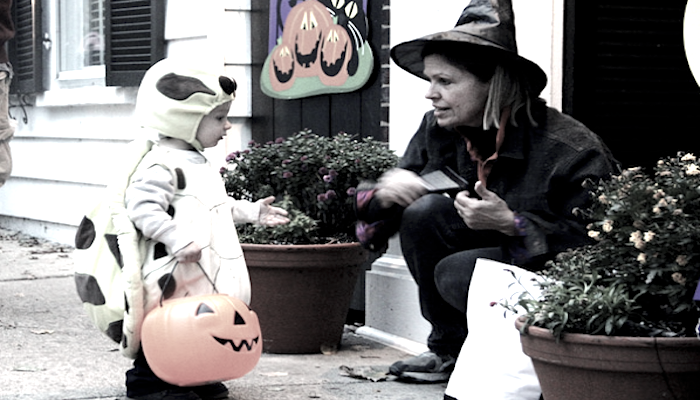 younger children should also hold the hands of the adult taking them to trick or treating. when choosing a costume for either your child or for yourself, consider what accessories and hidden safety issues the costume may have. costume that do not fits properly could a tripping hazard. make sure the length of the costume doesn’t drag the ground and that the shoes fit properly, read the label to make sure that the costume and accessories, such as wigs,are resistant to catching fire quickly.weapons accessories should be foam or soft plastic and flexible. also, they shouldn’t be too large. use Halloween make up instead of mask, this allows for a wider range of vision and make it easier to breath. always carry a flashlight. in fact it is advisable for each child to carry a flash light as well. this allows the child to see any dangers as they walk up to the door,especially at houses that are highly decorated with Halloween decoration. it also helps make the child more visible to drivers too. many stores now carry Halloween themed flashlight that will encouraged the child to want to carry one. 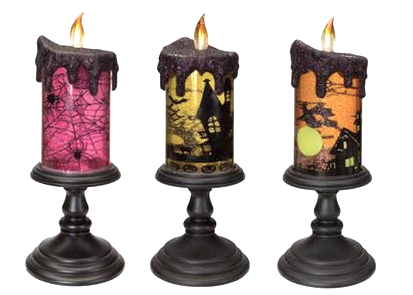 although it is encouraged to use battery operated lights, some people are still using candles in their pumpkins and other illuminated decoration. parents should teach their children to stay clear of any candles to prevent their costume from catching on fire, if such event should occur, be sure you and the child know basic common safety when putting out fires. Stop - if your costume catching on fire, the first thing you need to do is stop. do not take off running, this will intensify the flames and cause the flames to spread more. Drop - next you need to drop to the ground and cover your face with both hands. Roll - keep rolling until the fire is out. one of the hidden dangers to trick or treating is the candy. 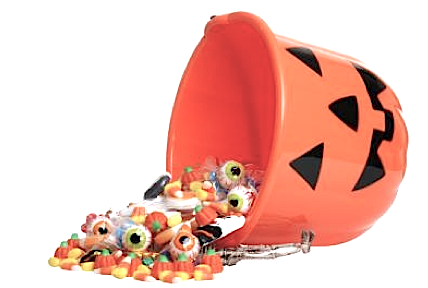 some demented have been known no temper with candy causing the child to become sick or high. all police agencies and health agencies advice parent to not allow children to eat the candy while they are trick or treating. all candy should be inspected by the parents before allowing child to consume any of it. Halloween is a fun time of the year that many children and some adults look forward too. by following this simple safety tips it will help make sure that everyone has a safe holiday to create fun memories to last a lifetime. Japan had four Season climate, the Spring,Summer,Autumn and Winter. but unlike some other countries who had too,Japan cycle is different from the countries such as, Canada, United States, Greenland,Eastern and Northern Europe, Mexico as well as the small island of the Caribbean. When this countries experience summer, Japan will experience winter and vice versa. for every season change in japan, there is also a flower bloomer. start from September until November, autumn falls in japan, and one of the popular autumn flower bloomer in japan is the Cosmos flower, some Japanese called it the ‘Autumn Cherry Blossom’. you will see this flower, blooming to some places in japan like Japanese residence garden, but you could see this more beautiful in a wide public garden place in japan. the cosmos was included to sunflower family who first originated from the country of Mexico who known to have a lots of cosmos species occur, according to Wikipedia.org, Cosmos flower is an annual and belong to herbaceous perennial flowering plants, who complete their life cycle from Germination to seeds production in a year and eventually dies on. There has variety of Cosmos colors such as orange, yellow, white, pink, and scarlet. it easy to take care on and cosmos can grow up to 60 inches tall. 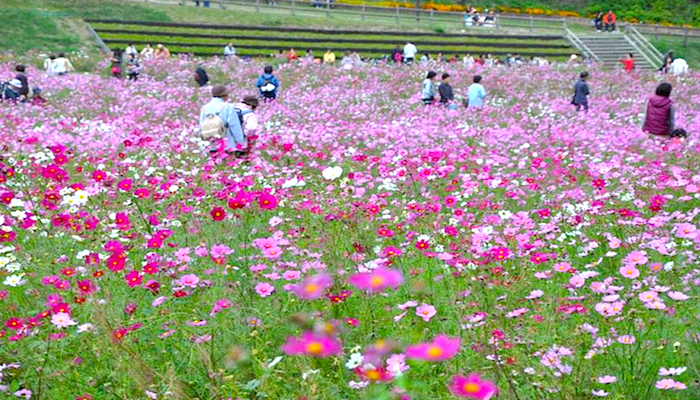 pretty good for garden decoration, cosmos viewing in japan is one of the popular outdoor activity every Autumn season. so, if you want to see or viewed cosmos flower in japan, places below are my recommended to see a lots of beautiful cosmos species. had million of cosmos flowers and reached on 17 kinds of cosmos are lay down there, it is open to public every last Sunday of September each year to the middle of October. Admission fee: ¥400 Japanese yen. 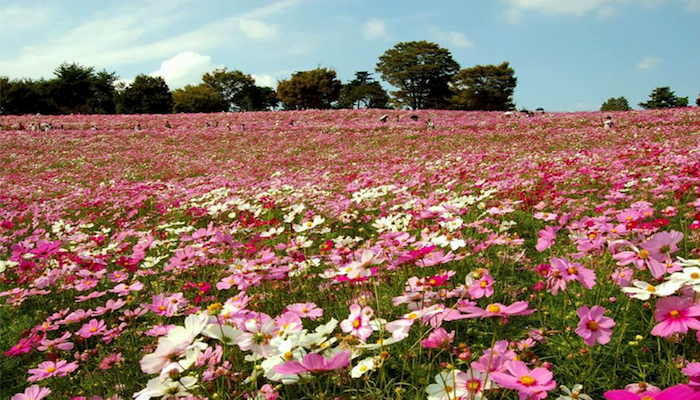 it could be the best place to go when viewing cosmos because of million cosmos flower blooming together here and uncounted kinds of cosmos are there. 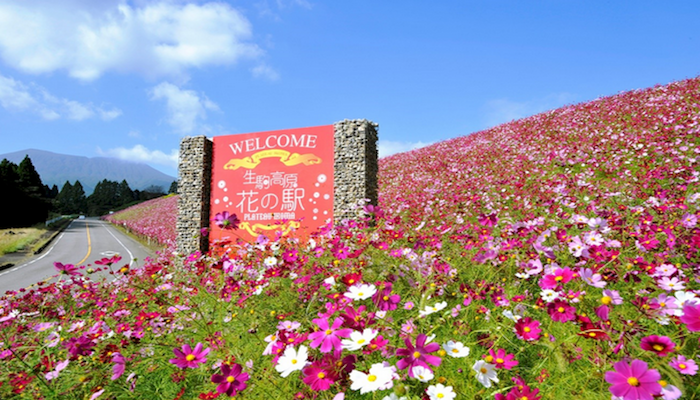 kurihama hana no kuni also known as kurihama flower park, is popular for its seasonal flower. you can also viewed a lots of herbal plants and purchased any plants what you like at the garden entrance. there’s a restaurant inside who you can enjoy tasting food while viewing the flower garden, a relaxing and worth place to spending on. Access: It is a 15-minute walk from JR Kurihama Station and Keikyu Kurihama station. it has 30 million square meter garden, you can also viewed their season flower each year. 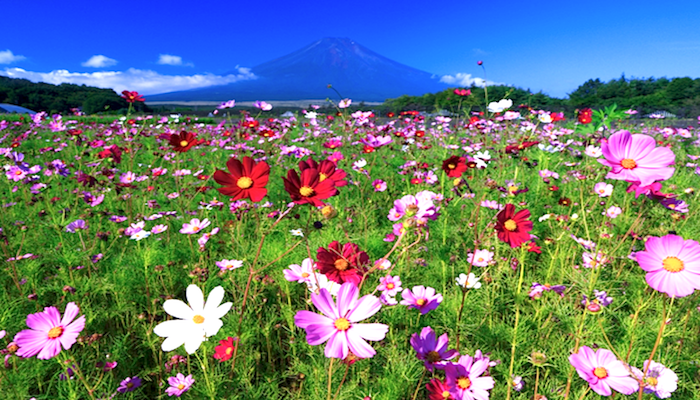 a 2 million pieces of Cosmos flowers bloom facing Mount Fuji every mid of August and September, you can also enjoy and viewed sunflower and this place become more famous for shooting point of many professional photographer for photo taking of Mt. Fuji or they called Fuji-san in Japan (the famous Mountain in Japan). Access: About 30 min from Fujisan Station on the Fuji Kyuko Line via the “Fujikko-go”, one of Lake Yamanaka’s sightseeing buses, near “Hana-no-Miyako Koen” bus stop. Address: Yamanashi Prefecture Minamitsuru-gun Yamanakako-mura the mountains 1650.